Discussion on Twitter during the Brexit referendum campaign was motivated by nationalist and economic concerns, and less driven by populist and globalist issues, according to a new study from City, University of London. The City researchers found three quarters of messages (74 per cent) displayed nationalist sentiments, such as the desire for the country to be self-governing, as opposed to 26 per cent that expressed globalist values, such as universal individual rights and international cooperation. Almost two thirds of tweets (62 per cent) focused on economic issues underpinning Brexit, like trade policy, instead of expressing populist sentiments (38 per cent), such as voters taking back control from elites. The study, published in the journal Information, Communication & Society, also mapped more than half a million tweets across the UK's 650 parliamentary constituencies. It was found that opinions posted on Twitter accounted for almost half of the voting patterns seen in the actual referendum, once demographic data were taken into account. Lead researcher Dr Marco Bastos said: "Our algorithm identified a prevailing nationalist sentiment, which persisted throughout the campaign and was only offset in the last days when a globalist upsurge neatly divided the British Twittersphere into nationalist and globalist sentiments. "What we found surprising was that tweets embracing nationalist content did not originate from economically fragile areas that were generally supportive of Brexit, like northern England, but from various other regions across the country, including remain-backing areas like Scotland." The research contrasts with some previous studies, which highlight the importance of populist ideas and global issues in the outcome of the referendum. While nearly 40 per cent of tweets presented populist sentiments, these messages were concentrated in a small number of constituencies. Only 10 per cent of constituencies presented prevailing populist sentiments, compared with economic issues, and less than 5 per cent presented globalist, compared with nationalist sentiments. Dr Bastos and Dr Dan Mercea – who last year identified a network of 13,500 Twitter bots operating in the referendum debate – analysed 565,028 tweets that were posted during the referendum campaign period, between 15th April 2016 and 24th June 2016. The posts were authored by 30,122 unique UK users, whose geographic locations were traced up to postcode level. The researchers gave each tweet a score on two scales: the first with nationalism at one end and globalism at the other, and a second with populism and economism at either end. They then looked at how often these sentiments were expressed during the campaign and how attitudes expressed on Twitter for each constituency matched the result of the vote. They found that their model "accounts for nearly half of the variance found in the referendum results", but only after they combined their data with demographic variables for each region, such as unemployment, that were associated with leave or remain voters. For example, all 72 constituencies with overwhelming support for vote leave (with 65 per cent voting to leave, or higher) presented predominantly nationalist sentiments. Conversely, only 17 of these constituencies had a Twitter debate predominantly defined by populist sentiments, with 55 of them being classified as economist. 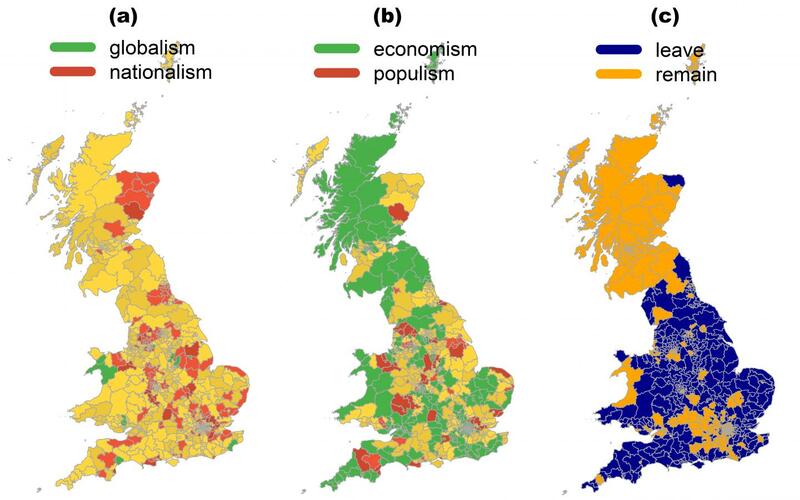 Dr Bastos added: "These are regions in which Brexit was wholeheartedly embraced and yet populist sentiments are not predominant in the Twitter data stemming from these constituencies." The researchers concluded that monitoring Twitter activity could reveal ideological shifts in the public opinion as expressed on Twitter, but that it could not predict which way they would vote. Dr Mercea said: "The study provides a proof-of-concept geo-locational analysis of political expression by the British citizenry on Twitter, but the results are restricted to the period of the campaign. Further research is needed to understand how the debate evolved following the referendum." Dr Bastos and Dr Mercea believe their method can be used during other political events to research public opinion. Is marital status associated with early detection of localized melanoma?